More and more often, it seems like many of us are faced with schedules that are anything but nine to five. That doesn’t mean we don’t still want to eat well, cook often, and have control over what we consume, though—even on days when cooking from scratch is impossible. In years past, my erratic schedule often meant ordering take-out or eating popcorn for dinner (okay, I still do that sometimes . . .). But the cost adds up, I hate being at the mercy of someone else for my food, and I really prefer to know what I’m eating. My solution? Be strategic about what I cook on the days I can cook, so that I can get the most out of every session in the kitchen. And that intentionality starts at the grocery store. While I crave convenience, I also loathe wasting food, so I buy key ingredients that will last a long time in the refrigerator or that can sit in a jar on my shelf until I need them. Spice blends will last for up to six months in a dry cupboard and take up very little space, so you can invest in ones you really love, and they’ll give even that last serving of leftovers strong, tempting flavors. You can buy spices in jars and use them as they are, but once you hit on combinations you love and will use often, you can buy bulk spices and mix up your own blends. Empty spice jars are available inexpensively from Ikea and your local grocery store may also have them in the spice aisle. Curry powders are favorites of mine—a little bit adds a subtle, almost unrecognizable warmth to a dish that wouldn’t usually contain them, and a lot gives you intense, unmistakable flavor. “Curry”—an anglicization of a Tamil word simply meaning “sauce”—refers to a wide variety of spice blends, but most curry powders contain turmeric, cumin, and coriander. If I’m using a store-bought curry powder, as I do here, I like to adjust the seasoning to include more turmeric, cumin, and coriander. And, because most curry dishes include chilies, I add cayenne or pepper for heat and smoked paprika for earthiness. Using long-lasting ingredients like spice blends, dried fruits, nuts, and salty pickled refrigerator staples like capers and peppers gives me a wide variety of flavors to choose from even if I can’t get to the grocery store. I especially love combining the brininess of pickles, the heat of spice, and the mellow sweetness of dried fruits in protein-packed salads that will keep in the fridge all week. As the salads sit, their flavors intensify, rewarding you for eating leftovers or bringing your lunch to work. My two favorites to keep in the fridge are my Mediterranean tuna salad and this curried chicken salad. It’s based on Trader Joe’s version, which I used to grab on the way home if I didn’t have time to cook. But I like mine better and it’s much less expensive to make. The best part is that there’s actually no cooking involved. I buy a store-bought roast chicken and make the salad as soon as I get it home—the warm chicken absorbs the flavors beautifully. The curry flavor is bold but not overpowering, and it has just enough sweetness to feel like you’re getting dessert along with your meal! You can eat it as is, or on a sandwich for lunch, or nest it on top of a bed of arugula with some pita wedges or sliced veg for a two-minute dinner. No carrots? No problem—swap in celery, or leave it out entirely. No fig spread? Up the amount of honey, or use the apricot jam hanging out in the back of your condiment shelf. No cashews or pistachios? Use almonds, friends. Don’t like nuts? No problem; leave them out and add bashed up pretzels for crunch. 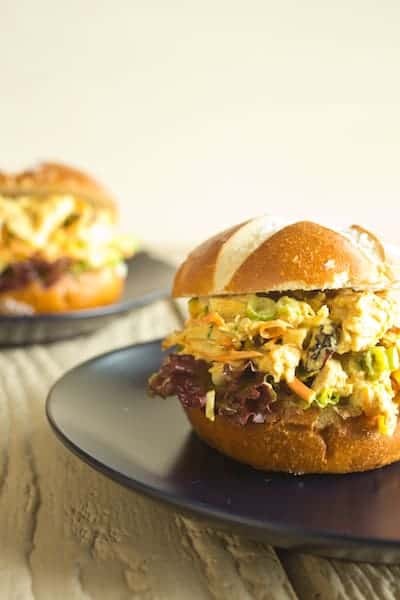 As long as you have chicken, curry powder, and sweet and salty flavors, your curried chicken salad will be dynamite! If you want to be fancy, stir the wet ingredients—mayonnaise and/or yogurt, honey, jam, and mustard—together with the curry powder and paprika in a large bowl. Stir in the chicken, nuts, fruit, scallions, carrot, and garlic. I can’t lie, though: I just dump all the ingredients into the same bowl and stir together because we’re saving time, here! 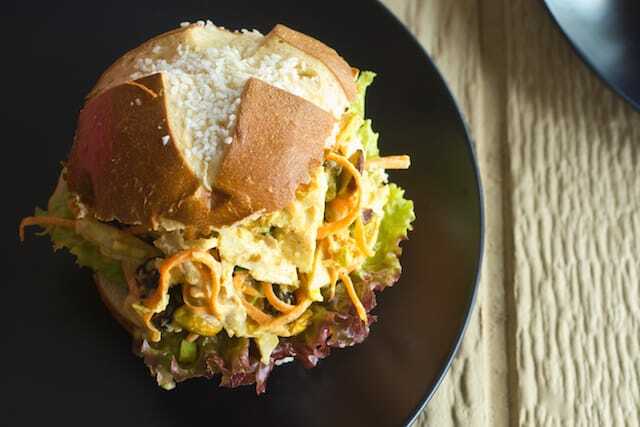 Taste the chicken salad and add salt, pepper, and the optional extra spices to your taste. I sometimes add another scallion or carrot if I want some more heft, or a little more mayo or yogurt if it’s not moist enough. Then put your chicken salad in the fridge and enjoy! The flavors are even better the next day.